Lt. Gen. (Ret.) William G. “Jerry” Boykin has always had a strong commitment to service. 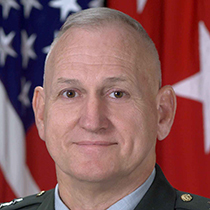 In all, Lt. Gen. Boykin spent 36 years in the army, serving his last four years as the Deputy Undersecretary of Defense for Intelligence. He is an ordained minister with a passion for spreading the Gospel of Jesus Christ and encouraging Christians to become warriors in God’s Kingdom. He now serves as Family Research Council’s Executive Vice President. He was one of the original members of the U.S. Army’s Delta Force. He was privileged to command these elite warriors in combat operations ultimately. Later, Jerry Boykin commanded all the Army’s Green Berets as well as the Special Warfare Center and School. Jerry and his wife Ashley enjoy spending time with their five children and a growing number of grandchildren.